March 2010 | Tired, Need Sleep. On top of this basic mission of Online Degrees, they have articles on education and a recently started blog where various aspects of education are discussed. Thank you all for reading this silly little blog of mine… I’m continually surprised at how many real friends I’ve made through blogging. The author writes short reflections on 31 passages in Luke; each scriptural passage is printed out in full at the beginning of each chapter, which is very handy, and I loved that I was getting in a little actual Bible reading as I made my way through the book. The main point of each chapter, and of the book as a whole, is to come to a deeper understanding of God’s love for each one of us personally. And how the understanding of that great love makes us more loving towards others, and more like Jesus. She makes a strong and important point about how we need to take time away from the many distractions of life and focus on our spiritual well-being and our relationship with God. This really hit home for me, and I gained so much wisdom and insight from this little book… it was the perfect thing for me to read during Lent, and in preparation for Easter. This review was written as part of the Catholic book Reviewer program from The Catholic Company. Visit The Catholic Company to find more information on To Be Like Jesus. While M was sick last week I gave myself a break from housework (well, except laundry, dishes, and cooking) and spent some time completing a few projects. This lapbook was one of them and I’m excited to share it with M this week. The entire lapbook is laminated so M can use dry-erase markers for some of the activities. Writing Skills Practice: Trace the D and d on the outside of the pocket, and follow the lines on the little card inside to help the baby ducks find the mother duck. We’ve been doing a lot of other dinosaur activities too… I hope to post about them soon! You can download all the pages for this lapbook here. Use them as activity packs or in workboxes… however you want! As many of you know, we rushed home from our trip to visit my parents and ran right into a bout of pneumonia (which thankfully is getting better), and of course I did not give the Art Box a single thought all week. By the way, to do the very cool marble painting, tape a piece of paper (sturdy construction paper or cardstock if you have it) to a pan with a small piece of double stick tape. M used a baby spoon to put globs of paint on the paper, then placed a marble on each glob (yep, technical term). Then he slowly tilted the pan around and watched the marbles make their tracks. Occasionally he stopped to look at it and decide what else it “needed”: He’s done this before with a golf ball, which, incidentally, made very cool tracks, so when I put marbles and a pan in his art box he knew what the idea was. It’s pretty mess-free, but the first time takes a little guidance so the pan doesn’t get tipped completely over. For a toddler, you could use a shoebox and secure the lid on with a couple of rubber bands, let your child shake it up a bit, then look to see the masterpiece inside! M is 42 months old. We visited my parents who live on our family farm in Missouri. It is more of a hobby farm now than anything (in its glory days it was a magnificent dairy farm, with horses and sheep to boot). M loved feeding the chickens, and hearing the rooster crow! I found a small foam ABC puzzle mat - the squares come apart and the letters all come out – for $1.00 at Walmart. Here M is lining them up like a train. After he finished placing the letters in he “drove” it (pulled it) all around the house. Beginning next week (or the next school post I get around to writing), I’ll be linking these posts up to the Preschool Corner instead of Tot School. I’ve been in denial that my baby is growing up, but have decided that our posts are probably more preschool-oriented now, although I do intend to keep school activities play-based and fun… no formal curriculum of any kind yet. 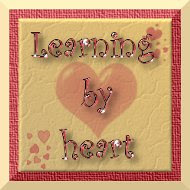 I hope all of you who read our Tot School posts will continue following M’s progress and our weekly activities! Click the button above to read about more great books for kids! The Golden Egg Book, by Margaret Wise Brown: This is a fun book for Easter that reminded me of stories I enjoyed as a child. The illustrations are beautiful and simple and in our house this has been a favorite all around. A little bunny finds an egg and wants to know what’s in it… so he kicks it, rolls it down a hill, and does what he can to find out. It’s so sweet and I don’t want to spoil the book for you, so I’ll just say he gets a taste of his own treatment and ends up with a friend. And no one is ever lonely again. :) Well, that may be going overboard a bit, but it truly is a sweet book that I think almost any child would enjoy. What’s Up, What’s Down?, by Lola M. Schaefer: This is an interesting and unique book that absolutely fascinates M. You turn the book on it’s side and for the first half you follow arrows pointing up and find out what’s above a mole digging in the ground, etc. all the way to the moon. Then you turn the book around and follow arrows downward, finding everything that is below the moon all the way to the depths of the oceans. It is pretty neat and I think adults and children alike will enjoy reading it! 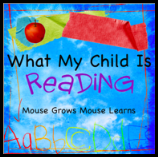 Check out Mouse Grows, Mouse Learns for more book recommendations! This is a pretty simple game…. place the baskets in numerical order from 0 – 10 (obviously you can do 0-9 or 1-10 if you prefer), then place the correct number of eggs in each basket. Here’s what the playing pieces look like: OR place the egg with the correct number of flowers painted on it in each basket. OR turn it all into a file folder game and do both. I decided to create a file folder game. I laid the baskets out on the inside of my folder and taped them down with small pieces of double stick tape along the top and bottom edges. Next, I took a very sharp pair of scissors (you could use an exacto knife) and made a slit in each basket. I had to be careful to go only through the top layer of contact paper and the basket, and not through the file folder itself. This turned the baskets into little pockets for the eggs. Despite the lengthy instructions for putting this together, it actually only took about 1/2 hour. Let me know if you use it… we are really loving it! The printables can be downloaded here. 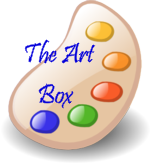 Link up your Art Box posts below! Put the game pieces in the eggs; there are 20 chicks and 5 other animals. The other 5 animals (cow, elephant, giraffe, zebra, and lion) each get their own egg. You can give each chick its own egg too, or put several in one egg and just a couple in another, etc. It depends on how long you want the game to last and how many eggs you have on hand. Place the filled eggs in a basket and mix them around. To play, each person takes a turn rolling the color cube then selecting an egg of that color. Open the egg and see what you have. If it’s a chick, yay! You get another turn. Put the chick in front of you and discard the opened egg. If it’s an animal whose life doesn’t really begin in an egg, your turn is over and it’s the next person’s turn. Count the chicks at the end and see who has the most! We’ve played some variations of this, which are just as much fun. Those variations are explained in the .pdf file. It's a good game for counting, learning to take turns, and learning that some animals hatch from eggs and others are born from mamas. Click here for the printables.